For spraying bathtubs, you’ll need a spray system that is versatile, portable and dependable. 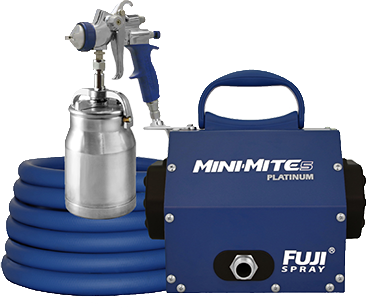 With bathtub resurfacing, the Fuji Spray® Mini-Mite PLATINUM™ series lays down a smooth coat with minimal overspray. You can a produce professional-looking mirror finish every time! As the top choice in the bathtub resurfacing industry, the portable Mini-Mite PLATINUM™ series is designed to give you optimal flexibility and control for all applications. For the bathtub refinishing process, where quality and portability are vital, it provides for the ultimate in results. For your bathtub resurfacing needs, consider our Mini-Mite PLATINUM™ sprayer.